Andrea Lee stands five feet, seven inches tall, with thick hair that brushes past her shoulders when it’s not in a ponytail. Trailed by her Yorkshire terrier, Toki (Korean for “bunny”), the 17-year-old moves with an athlete’s erect gait around her Hermosa Beach home. Lee has always been physically precocious, and the house is filled with sports trophies and plaques. She mastered the 35-foot-high rock-climbing wall at a Manhattan Beach complex when she was 4, then competed briefly in figure skating. At 6 she was named the MVP of her youth soccer team and six years later earned a black belt in tae kwon do. But it’s golf that she loves and that seemingly loves her. Lee first swung a club at 5 and at 8 began entering kids’ tournaments, winning 50 competitions in four years. When she turned 12, she became eligible for American Junior Golf Association events, emerging as the top-ranked girl by the time she was 15. That year Lee was also the youngest player to make the cut at the U.S. Women’s Open at Pinehurst No. 2. She went on to claim two consecutive junior golf titles (the Rolex Tournament of Champions and the inaugural Yani Tseng Invitational) before advancing to the semifinals of the U.S. Women’s Amateur Championship. Early this year she was named to the U.S. squad competing for the Curtis Cup in Ireland in June. “Work” means steering her car to the driving range at the Harbor Golf Practice Center, a routine that was interrupted early this year when the facility shut down for storm repairs. As Lee sets up at one of the end stalls, white plumes from a nearby refinery billow skyward; at her feet is a frayed mat. The range that serves the working-class Harbor Gateway community has few pretensions, making the quality of Lee’s shots stand out even more. There’s a gracefulness to Lee’s movements that belies the workmanlike nature of the sport, which demands hours of repetitive movements. “When you watch Andrea hit balls, she’s never in a hurry,” says Craig Chapman, a Marlboro-puffing, harmonica-playing teaching pro who’s trained local talent since the 1970s. “Most people out here, they’re just beatin’ balls—they’re not going through that ‘mode,’ ” the studied setup that every player should follow but that weekend warriors seldom have the patience to perform. A rectangular mirror sits behind Chapman’s bench, and Lee takes an occasional peek at her backswing. “She likes to look at herself,” drawls Chapman, flipping the tassels of his loafers as he delivers the playful dig. Lee smiles and shakes her head, then resumes swinging her 6 iron. When asked whether Lee has the stuff to go pro, Chapman, who’s produced several PGA and LPGA competitors over the years, peers into the distance. Yes, he says, and not only because she’s showing the mixture of commitment and drive that’s put young Korean girls atop the leaderboard in junior golf. Andrea Lee—not her parents, not her teacher—hates to lose. Koreans are famously crazy about golf despite the fact that the sport is so expensive in their native land—$300 for a round at public facilities—that only the richest can play. Angelenos, meanwhile, can tee off at any of the city’s 13 courses for well under $50 for 18 holes and $20 for 9. Many Korean families make a point of leaving the peninsula to vacation in L.A., where they can pack in lots of time on the affordable courses and train with Korean-speaking teachers. Once home, the golfers dive back into the next best thing—virtual reality—playing millions of rounds of Screen Golf at the more than 7,000 venues. Los Angeles, which has the largest Korean population outside of Korea, also happens to have the most public-run golf facilities of any major metropolitan area in America. The response by Korean residents to this abundance has been electric. James Ward, golf manager for the City of Los Angeles, estimates that Asian golfers, the majority of them Korean, account for nearly a fourth of the players at the municipal venues. Kyeyoung Park, associate professor of anthropology and Asian American studies at UCLA, says that while Korean parents still aspire for their children to become doctors, lawyers, and other high-end professionals, they’re warming up to the prospects of a career on the golf tour. “It can be another way to make it in the U.S.,” he adds. Especially for women. When Se Ri Pak won the U.S. Open in 1998, she became the role model for the legions of Koreans who were picking up the sport. By the start of the 2016 season, at least 7 of the top 15 players on the LPGA tour were Korean, including top-ranked, New Zealand-reared Lydia Ko. Initially, aiding Andrea’s sports exploits was time-consuming but manageable. Once she became hooked on golf, however, and competing on the junior golf circuit, the demands on James and Sunny rose dramatically. “It’s a full-time job, really,” James admits. “This is an individual sport; you take them to a lesson individually. It’s not just something where you drop them off at a basketball court or have a team mom pick your kid up.” A normal week involved 20 hours of shuttling Andrea to and from lessons and entire days on the road if they were traveling to competitions. Then there was the expense—about $40,000 a year for lessons and tournaments. 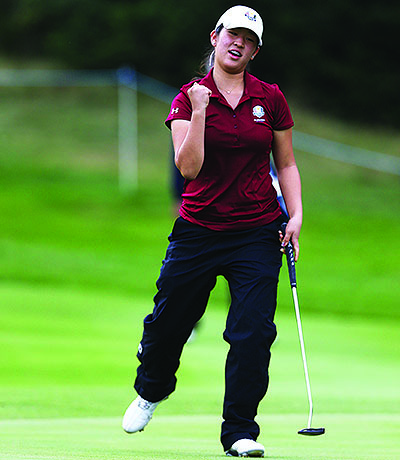 In the fall Lee enters Stanford on a golf scholarship. She’s looking forward to the collegiate competition but has her eye on the pros. One option is to pursue the same path as Alison Lee, a 2013 graduate of Valencia High School who earned an LPGA card after a record-setting season at UCLA and remains enrolled in school. “My ultimate goal is to become a professional player,” Andrea says. Previous articleParty Shot: Richard Linklater and Jack Black at Everybody Wants Some! !